Resume my National Service liability of 26 days during my vacation in Dec 07. - DONE! » new NSF ORD on 28 Dec 2007 (Fri). Raise S$32,000 at the end of my 4-yr uni course in Aug 2011. This is to repay the loan for uni tuition fees. Dream: giving u a sense of direction and purpose. "Where do u see yrself in 5 yrs time?" A source of motivation and gives a sense of achievement along the journey to success. Cycle the 42km Eastern Coastal Park Connectors Network (PCN). “Beware the barrenness of a busy life.” - Socrates. Never get lost in the “busy-ness” of life; avoid all of the distractions and attractions. - ask yourself daily: not "What am I doing," but, "What am I accomplishing?" initiate. change. create. explore. capture. disrupt. collaborate. experiment. question. invent. discover. Set aside time to pause, breathe and think abt what worked & what didn't. > Use your last 5 min of each work day to self-REFLECT. 1. How did the day go? What success did I experience? What challenges did I endure? 2. What did I learn today? Abt myself? Abt others? What do I plan to do — differently or the same — tmr? 3. Who did I interact with? Anyone I need to update? Thank? Ask a qn? Share feedback? "Success is made through motivation, focus and patience. Successful people always possess the desire for something more. They are not satisfied with what they have, and so they strive for something better. There have been no victors who did not want success. A person with no ambition is like a boat without a rudder." "Don't ever let somebody tell you... You can't do something. You got a dream... You gotta protect it. People can't do somethin' themselves, they wanna tell you you can't do it. If you want somethin', go get it. Period." "The Pursuit of Happyness: Basketball Scene" uploaded by dlo316 on Apr 1, 2008. "Reel Wisdom: Lessons from 40 Films in 7 Minutes" uploaded by Superluminal805 on Jan 29, 2011. I feel that spending 2 years of NSF life is like doing 2 years of internship. We gain working experience during this 2 years. when finished 1 task, ask for another. let yr boss know specific things u would like to learn and get involed in. don't wait around and whine that nobody is giving u work. work does not always have to be exciting. complete all tasks with enthusiasm and professionalism. enjoy what u do. -> u'll look forward to going to work every day. take pride in what u do, find interesting factors abt yr job. u're an impt link to the organisation. but u're not expected to know everything. Seek advice when faced with problems. "Ask and it'll be given to u; seek and u'll find; knock and the door will be opened to u. For everyone who asks receives;"
don't fade into the bkgd. being an NSF doesn't mean yr opinion is not valued. u're rewarded with money whenever your suggestions is implemented and put to good use. keep thinking of new ways to improve the way u do things. Think of how u can contribute to the organisation. Be the best in yr area of expertise. Have in-depth knowledge and learn more to do yr job better. Meet more people, know what they do. This is to familiarise and understand the organisation's operations more clearly. This is to get a clearer and bigger picture. relationship built with supervisors & colleagues are vital. always leave on GD terms. a letter from yr boss can be useful, esp. if he has GD things to say. u can ask yr boss if he can serve as ref. this note to yr boss & anyone who was supportive during yr NSF life, leaves a GD impression. The last impression matters juz as much as the 1st. and managed to get myself this job during the holidays. I enquired the SALES EXPERIENCE. And I think this is beneficial for my future career. that will position me well in future. I just wanna share with you how I go about doing it. What is your objective: Clear stock or Xmas sales? Keep focused on your objectives. How are you going to promote the product? What are the Frequently-Asked-Questions (FAQ) by customers? or they're simply not interested at all. You must have counter-measures to attract their attentions. and the ability to bounce back from rejection. Rejection is part of the game in sales, and not be demoralised by it. You must have the drive to push sales to completion quickly. if you don't get your clients everything they need, right when they need it. You need the desire to persuade people and close the sale. Be assertive to get a "yes", and be successful. and to get the point across confidently. Treat every customer like your friend. Make the effort to go the extra mile. Hope this is beneficial to you. except that you're selling yourself. "Bicycle" - be it leisure or sport, it brings you good health, and you can enjoy the scenery as you cycle. In recent years, global warming has caused environmental and climate serious damage including melting glaciers and Arctic climate anomalies, have become a serious global environmental issues. Damage to the environment and the culprit is the excessive use of motor vehicles emitting carbon dioxide. Therefore, countries in the world have the "Kyoto Protocol" agreement to reduce carbon dioxide emissions. However, these measures are still slow in coming to limit further fuel vehicles uses. Bicycle, pollution-free and convenient parking is the most practical means of a short-range transport, as a shopper, friends and convergence transit systems, and other public transport modes. Bicycle - no noise pollution, no air pollution, and without energy consumption and is the most environmentally friendly means of transport. Bicycle convergence to public transit, thus substantially reducing the use of motor vehicles. This will significantly reduce carbon dioxide emissions, and the problem of global warming can get real relief. Bicycle can provide new tourist experience. Walking is too slow, driving too fast; bicycles can allow tourists to experience local culture and scenic beauty. Tourists can get a deeper understanding of Singapore. There are plans to form a national bicycle lane network to promote cycling activities. Health benefits: Due to the change in lifestyle and dietary imbalance, and the global "obesity" is spreading, Singapore cannot escape. Many people have started to pay more attention to health and exercise. Cycling is the most non-injury sport; this will be able to encourage more people to cycle. Cycling promotes physical and mental health of all people, thereby saving huge burden on health care resources. Cycling promotes healthy living, and it is environmental-friendly (pollution-free). To reduce carbon dioxide emissions, we hope to call for people to cycle as a short-term means of transport, instead of using pollution-emitting transport. "Everyone bikes, save the earth." Plastic bags are pests to the environment because they are used only for a short while, but take hundreds of years to break down. In one day, Singapore can save 100,000 plastic bags. Look at the amount of plastic bags saved! Read "100,000 plastic bags saved on Bring Your Own Bag Day" in Channel NewsAsia. "I don't need a bag." Business owners can save on the cost of plastic bags. And they can pass on these savings to the consumers. In Taiwan, it is common practice for shops not to provide plastic bag for free. They ask shoppers whether they want to purchase carrier bag. 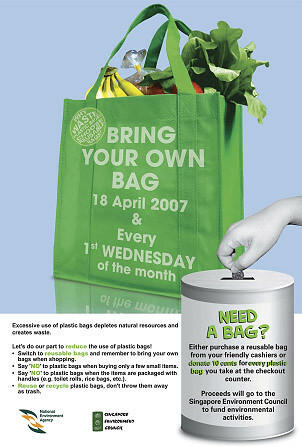 We hope to call for everyday as Bring Your Own Bag Day, not just every first Wednesday of the month. "Make it a habit to recycle plastic bag. Bring your own bag." In Taiwan, the people properly sort the garbage they generate for recycling. Read "Restaurants set the new recycling trend" in The Taipei Times. Consumers are encouraged to dispose their waste in four different bins: leftovers, recyclable materials, regular waste and liquid waste. Separate your glass, aluminum, plastic, and cardboard for recycling. World Environment Day is on 5 Jun. Are we consuming Earth's natural resources more than Earth can renew itself? How long will our future generations be able to live on Earth? Appreciate our Earth's natural environment, Happy Earth Day! (22 April). Every action that we take will impact our environment. Let us do the right thing! Youth.SG is an online space for YOUth to hang out, make friends, and do stuff. You can talk about your interests - gaming, sports, music, you name it. You can share your ideas and ask for advice. Erase any –ve tots that is not useful. Choose the right career path. in order to make a success of it. Aligned with my beliefs & values? Improve yr knowledge on industry / job. Be committed to improve self. Self-motivated and proactive in self-development. and acquire the relevant competencies for yr career progression. · SWOT, yr unique selling proposition (USP) – what u’ve to offer. What do u enjoy doing? - take time to consider. - how to get it? When I graduate from school, this is one of the things I plan to do - Travel. To see the world! I'm always happy when I'm near water. I love to swim, sail or boat on holidays. so I normally keep visiting the same destination over and over. while taking up employment to cover travelling expenses. An additional 30 days of optional traveling time is given to students. International students from all over the world come together in USA for an unforgettable summer. This program creates the opportunity for cultural exposure and international work experience. Get to work in places such as US Theme Parks, National Parks. Work & Travel USA is available only once a year in Singapore for the summer vacation from late April/May through to September. "Love is simple yet addictive"
with those who are quite opposite to me in nature. I'm strongly attracted to people who are confident, strong and successful. makes many of these affairs one-sided. I'll be most likely governed by my head. will reward the majority of Cancerians with a reasonably happy married life. believe in saving for the rainy day. I love my home, it is where I feel most secure. hoarder and for some it can take a while getting used to this. Note to self - Self-expression: Tell someone how you REALLY feel today. The length you stay at each stage varies. The decisions you made change the stage you're in. Not all relationships go through each stage. "Strangers, again" uploaded by WongFuProductions on Apr 20, 2011. SMU's Bachelor of Business Management programme at Lee Kong Chian School of Business for the Academic Year 2007-2008. This is a 4-year full-time programme. The first semester of the programme will commence on 20 Aug 07 and ends on 31 Aug 11. Online Acceptance of Offers from 2 May 2007 to 4 June 2007.
discuss, and voice one's opinions. To be trained to be outspoken and confident. 离开地球表面 只要越跳越高. come on Jump! the SMU Jump..
u don wanna miss out anything. Be there at least 15 mins BEFOREhand. don sms or make a call during class. Placard - show the world what's yr name. Preparedness - read up before class. So that you're able to participate in discussions. ask Qn; express yr opinions. bring yrself to say what's on yr mind. what the heck.. just say it.. u're not dumb. > at least make one meaningful contribution in every class. try to stimulate discussion in class. speak sense in a confident way. think critically and formulate opinions about what you're being taught. Tuition fees are billed and payable in 2 instalments for each acad yr. The 1st instalment will be payable on matriculation day (Term 1 of Academic Year 2007). together with original receipts and copy of referral letter and submit to Rochelle (OSL). Card holders are entitled to concessionary travel on buses or trains. Apply for one at selected TransitLink Ticket Office counters. Then wait for email confirmation by SMU on where to collect the card. It takes about 4 wks. Visit the Office of Career Services (OCS) station during matriculation and participate in the Community Service Fair. Register for the OCS Orientation Exercise, and collect your welcome kit. Attend at least one compulsory Volunteerism Talk. There is a talk scheduled on the hour, every hour. Sign up for one of the major projects lined up especially for you. Embark on a Community Service project between July and December 2007. This annual camp, organised by the SMU Students' Association (SMUSA) seeks to induct all freshmen with the SMU CIRCLE values – Commitment, Integrity, Responsibility, Collegiality, Leadership and Excellence. All freshmen will be assigned to ONE of the four runs on Matriculation Day. During the camp, freshmen will get a touch of the vibrant SMU culture, foster new friendships and be introduced to our unique university experience. The camp will promote team-bonding and individuals will learn leadership skills through the various activities. Boasting the largest school population in SMU, the Bondue Orientation Camp is definitely the best platform for you to get acquainted and interact with other Business students. The camp will be a specially designed 3-day programme open exclusively to LKCSB undergraduates and for the first time, the camp will be held in two separate runs (10th–12th July and 3rd–5th August) to cater to your schedules and convenience. Bondue, the SMU Business Society, was established to foster stronger bonding among the business students. This year, the Bondue Orientation Camp promises whole new loads of fun, excitement and entertainment and we welcome you to join us in making new friends and immerse yourself in a remarkable and unforgettable experience! At the academic briefing, you will get to meet your respective Deans and key faculty members. You will also be briefed on the details as well as some of the courses that you could take for the coming academic year. We will also help to answer any queries that you may have pertaining to your degree programme. You may choose to attend two briefings if you have opted for a double-degree programme. We will also give you an idea of what BOSS is. BOSS is short for “Bidding Online SyStem”. This is a unique system that allows you to bid for your courses using “e-dollars”. As part of our scheme to mould you into smart business leaders of the future, we have created an on-line system for course registration that uses the bidding process. In SMU, all course registration is done via BOSS. 7th July 08 (Mon) start bidding for Term 1. 3rd Nov (Mon) start bidding for Term 2.
to work out your study (course enrolments) plan for Term 2, 2008-09 and future terms. > Mandatory Courses – these compulsory courses must be completed by students in the programme. > Planned courses – these include the elective courses that a student intends to take in order to complete his/her degree requirements. The worksheet also provides a GPA calculator, where students can predict future grades for courses yet to be completed, and compute the resultant GPA. - an uncertified copy of your academic record. - should be used for reference, or in circumstances where a certified copy of your academic record is not required. - provides a representation of the degree rules that apply to a student (based on cohort). The student’s academic work is analysed against these rules and whether or not the different requirements are satisfied. The report also indicates how the requirement is satisfied. > Run the degree progress report based on your coursework to-date. > Register a What-If scenario (What if I change to this major? Or, what if I take these courses?) and run the report under that scenario. > Retrieve a previously generated report. SMUX Camp, an annual signature event of the SMUXtremists, promises to be THE most exhilarating freshmen camp at SMU. Jam-packed with outdoor activities such as biking, scuba diving, kayaking, trekking and inline-skating, this 3D2N camp is definitely your ticket to loads of adventure, fun and bonding. All SMU freshmen are invited to participate in this camp, whether you’re an outdoor enthusiast or not! Just come prepared for one great adrenaline rush. So take a blast, from 14 to 16 August 2007! Unlike conventional interpretation of "Convocation" to denote "graduation" at other local universities, SMU's Convocation is basically a large assembly celebration to mark the start of a journey, your journey through SMU, at that. On hand to welcome you into the SMU family will be the Chancellor, the President of SMU, the Board of Trustees, the Deans, faculty, staff and seniors. Our previous Convocation ceremonies have always been memorable for all and promise to be dignified yet energetic. At SMU, parents and guardians of students are regarded as an integral part of the university so we'd like you to invite them to celebrate the beginning of your journey with us. To all you freshmen, be prepared for the pomp and gaiety that SMU's largest and most talked about event will bring as you begin a new chapter in your life! The first university-wide event to greet all students at the start of the academic term! VIVACE is organised by the SMU Students' Association (SMUSA) for all freshmen to participate and be engaged in a fun-filled day of activities that will allow them to witness the vibrant student life in SMU as well as to interact with their seniors. So, come and experience it for yourself through all the carnivals, performances, games and competitions. All CCAs representing the arts, sports and community leadership will be on display to cater to your interests and talents. like peace, human rights, respect for international law, social progress and freedom. SMUSAIC is a club with a passion for photography, cinematography and digital media. SMUX Biking Team caters to the needs of both new cyclists and regular bikers. longer expeditions to destinations we have not ventured to, like the Southern Islands. I went for Pre-enrolment Medical Examination at Raffles Medical Group. The cost will be borne by the students. After 1st July 2007, it's 7% GST. I went on 9th July 2007. It cost: S$19.25. They give u a small plastic bottle to fill-in yr urine. Then they take yr height, and weight. Followed by eye test, then colour vision test. Next, is Chest X-ray. Lastly, the doctor talk to u, take blood pressure, ask u breath-in, breath-out. Finally, he signs and stamp the document. Voila! The medical report is out. At SMU's website, it says, "3. You can collect your medical report and X-ray after 3 working days for local students." But I got it on the day itself, no waiting for 3 days. Very efficient. Took the test on 10 July, 4pm. Didn't do very well (esp. basic cloze test: fill-in-the-blanks passage), but tried my best by filling-in all possible answers. I got my ELW Waiver Test result on 16 July. This is to inform you that on the basis of your ELW Waiver Test results, you will need to attend the English Language Workshop (ELW). Guess my English needs some brushing up. And I have to pay the course fee of S$200 (inclusive of GST) for the workshop. As a polytechnic graduate at Temasek Polytechnic, I had participated in some form of business attachment programme at Standard Chartered Bank, during my course of study, Diploma in Business IT. SMU would be glad to consider granting partial or full exemption to the Internship Programme requirement (10 weeks). Just provide some documentation from the institution on the duration of your previous training attachment. b) Letter from your company on their letterhead stating your name, NRIC/ Passport No., job descriptions and period of employment. Apply for "LKCSB Student Fund - Exchange Programme Grant"